Scroll down and read below…. 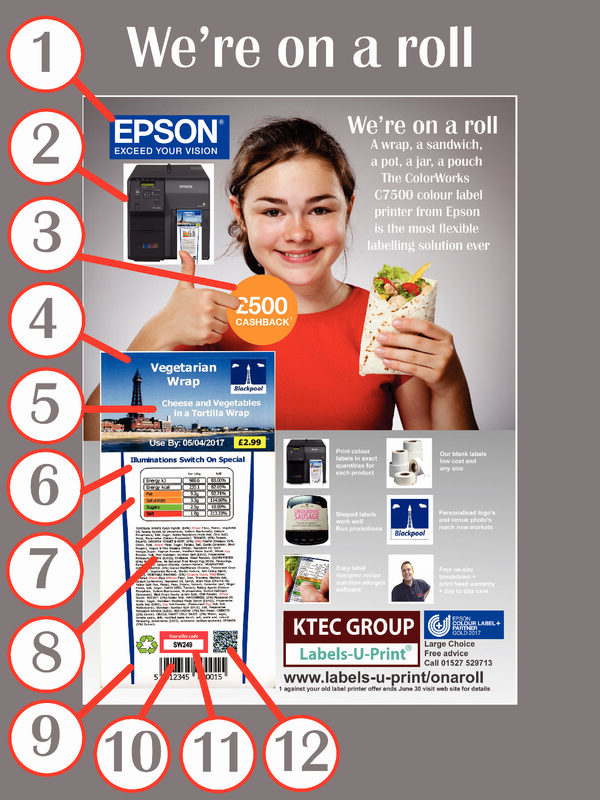 1) KTEC GROUP are a colour plus partner with Epson providing full colour roll label printers, blank labels on rolls, label design software and day to day support. 2) The EPSON ColorWorks series printers are ideal for food and drink labelling. The C7500G for example has bulk ink tanks so the cost per label is low. There is no print ribbon needed so no ribbon crease problems or spent ribbon waste. 4) You print as many colour labels as needed for each product. Personalise the labels with customer logos, product and venue photos and win new supply contracts. 5) Meal titles, expiry date and prices can be varied for each product produced. 7) Nutrition details specific to each product can be added automatically at print time using our BarTender or FMS recipe labelling software. 9) Add shape makes for interest. We design and supply labels die-cut to shape to suit your product. If you peel off the label sample provided you will notice we made this label in two parts and of different shape to suit a specific product package. Labels can be squares, oblongs, circles, ovals or any special shape like for tamper evidence. Let us know what shapes suit your products and packs. 10) Include a retail barcode numbered to suit each product and you can supply your products into retail stores. You will find more orders arriving when the stores automatically scan your products at the check out, notice the popularity and order more. 11) You can run promotions. Add promotional codes to batches of products and drive customer to your web sites for tempting offers that will accelerate sales, like meal deals for example. 12) Incude a QR code so customers can use their smart phones to scan the code and visit your web site. Web site pages can contain further details of meal specifications and information you use to promote your company and its products further.